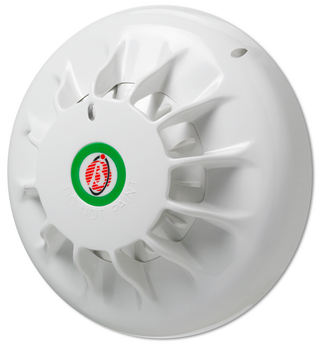 The FC400H is a flexible cost-effective addressable heat detector with all the features of FireClass detectors. The FC400H returns the temperature to the FireClass 500 control panel which allows various detection modes to be implemented. The FC400H uses a high quality thermistor with very low thermal mass. This allows the detectors to provide fast accurate temperature detection as well as heat detection. The 5B standard base or the FC450IB isolator base can be used with the FC400H. The FC400H can be used with the FC430SB sounder base.